Last week I hosted a fantastic party to introduce the Graco SnugRide® Click Connect™ 40 to 14 other Mom bloggers in the Atlanta area. I was honored to be the host and get a first-hand look at this incredible new car seat. We all met at the fabulous Country Inn & Suites in Buckhead which was an amazing host to our event. TGIFriday's provided us with delicious food to munch on as well. 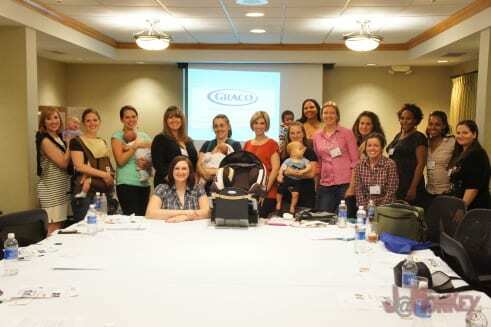 We got to mingle and talk about our cute babies (some of which attended) played some trivia and then got to get hands-on with the Graco SnugRide® Click Connect™ 40. A few weeks ago I received the new Graco SnugRide® Click Connect™ 40 the first and only infant car seat of it's kind that grows with your child allowing them to stay rear facing until the recommended 2 years. In 2011 the American Academy of Pediatrics changed it's recommended age for a child to be rear facing. When the recommendation was made back in 2011 I wrote this post all about the changes and what it was going to mean for parents. I mainly thought it was super silly even though I know it's what's best. I was guilty of turning my baby around early because she reached the weight limit before her birthday. But not this time around. Not when there is such a great option for keeping your baby rear-facing longer. Graco knew what the main challenges were to parents, making sure the child was comfortable so parents wouldn't be tempted to turn them around earlier. An innovative adjustable base with 8 reclining positions provides more leg room as your baby grows. Lil' Peanut is about 8 months old and we are still in the first position without her feet touching the seat. In our old car seat, she was already touching. Once your child does get to the age that their legs are hanging off the edge you can pull up the footrest to save your seats from dirty footprints. When the seat is in the high positions the seat begins to angle upwards so that your child isn't “laying down” anymore. This is another way they've accommodated your child's comfort into the seat. But Graco wasn't just thinking or your child in designing the SnugRide® Click Connect™ 40. They made things “one-click” simply. The first way is through the Simply Safe Adjust harness system. This is my personal favorite feature of the car seat. It allows you to adjust the headrest and the straps with an easy sliding action. No need for struggling to rethread the straps! It's super easy and fast. This was one of the other bloggers favorite things as well. That last feature that stands out and makes this car seat so great is the Click Connect™ attachment. This allows for simple transitions from car to stroller with a simple “click.” There are a handful of strollers with the Click Connect option with additional options hitting the market in 2013. 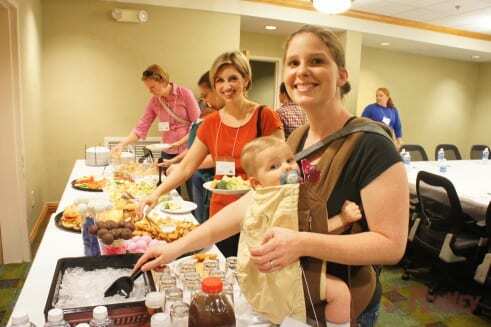 You can purchase the Graco SnugRide® Click Connect™ 40 exclusively at Babies R Us in two fashions Moomstruck (pictured here) and Mena (shown in video). The Graco SnugRide® Click Connect™ 40 – the first and only newborn to two-year infant car seat that actually grows with your baby from four pounds all the way up to 40 pounds. The car seat is designed for a parent on the go. The infant car seat can be easily removed from the base and used as a carrier when the infant is small, providing portability and convenience so you can easily move your infant in and out of the car without disturbing them.The American Academy of Pediatrics recently made the recommendation to keep all children in rear-facing car seats until the age of 2. 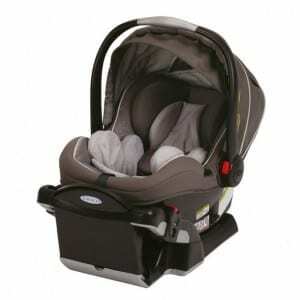 Graco set out to make this product so parents can keep infants rear facing longer while still keeping them comfortable.This is a sponsored post written by me on behalf of Graco. The opinions and text are all mine. Thanks for inviting me! I really enjoyed meeting all of you in person and learning about the new laws and Carseat. I love all of the different positions that the SnugRide 40 can accommodate! Great party! Like you I thought the recommendations were silly at first but after listening to the facts Graco provided I will think differently now. Thanks!! I wish they had this when my kids were babies.